Center of the Arts Universe | Arts and Culture | Style Weekly - Richmond, VA local news, arts, and events. The Ashland Arts Alliance wants to change the perception of "small-town art." 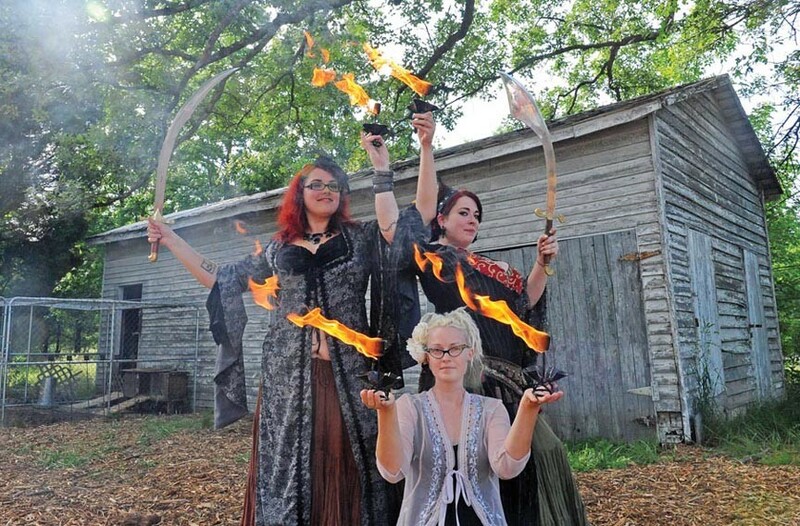 The Ashland Arts Alliance recently held a Beltane festival in Doswell that featured Clockwork Collective fire dancers Nicole Randall (front), Heather Addley and Courtney Ford. The festival is only one of many events co-sponsored by the newly-formed alliance, which is dedicated to creative self-expression. "Everyone in the circle please shift one seat to the right" is the motto of the newly formed Ashland Arts Alliance. Its catalyst-in-chief, Arthur Brill, started the group as a creative industry cluster of not only professional visual and performing artists, photographers and craftsmen, but also novices, hobbyists, and students interested in being part of an artistic union centered on Ashland. "The idea is that sometimes only a slight change in our perspective presents solutions to our problems," he says. With the three primary objectives of collaboration, referral and solidarity, the one-month-old alliance has gained 68 members and counting, hailing from Alexandria to Midlothian. "Artists need to understand their value to the economy and to their community," says Brill, a set designer, master prop builder and musician. "They need to be valued as tools in economic growth. It's not about exposure; this is a serious organization for creative people getting paid for their work in an environment more conducive to producing it." Using Meetup.com as its website, recruiting tool and online calendar, the alliance already has been part of 11 arts events, with several more planned. "The alliance is not just to support the arts, but to support the artist, and changing the perception of what small-town art should be," Brill says. The most recent event was a rain-delayed Beltane celebration May 19 at the Clockworks Collective, a multifamily artistic homestead in Doswell. Events included art, music, games and swimming for the children, a maypole and fire dancing. "We are dedicated to creative self-expression, self-sufficient living, nurturing parenting, and intellectual pursuits," Alliance and Clockworks member Courtney Ford says, clad in a spectacular handmade dress beside her herb garden. "We are proud to be a part of the alliance and want to do whatever we can to promote it." Convincing Ashland leaders of the importance of visual arts is an important goal. "By locating art in significant areas throughout Ashland, a positive visual message is conveyed that Ashland is a town that supports the arts and its local artists." Brill said in a letter to Ashland Town Council and to Mayor Faye Prichard, suggesting that proposals for visual displays that do not conform to existing sign ordinances may be considered art and thus promote local business in a "creative and appealing way" rather than as an "ocular insult." Another goal of the Alliance is create an arts space to pair arts educators with nonprofit groups to secure funding for independent arts education. The charity would act as a middle man, and the tax-deductible contributions and grant money would go to provide free arts education to the underprivileged in the area. "This is not just about ladies doing landscapes," Brill says. "It's time for all artists to come out, and make Ashland truly the center of the universe." For information on Ashland Arts Alliance events, or to join the Alliance, go to meetup.com/Ashland-Arts-Alliance.